Progressive management began with Scientific Management in the late 1800s and has evolved and improved through the years into what we now call Lean management. The rationale for changing from conventional management to progressive Lean management is not to lay people off or cost reduction. It is, instead, to grown and improve, and to do so in ways that do not cause to the people in the organization or its stakeholders. Lean must do no harm. Unfortunately, leaders often adopt Lean for the wrong reasons – cost cutting and layoffs – which creates fear and anxiety among workers. Even if Lean is adopted for the right reasons, workers will still fear it because they are wary of management’s intentions and do not want to bear unfavorable outcomes. Nobody wants to be the loser, especially employees who depend on their job for their livelihood. They want no harm to come to them. That’s easy to understand. For Lean management to function correctly in an organization, it must be practiced in a non-zero-sum (win-win) way. If Lean is practiced incorrectly, in a zero-sum (win-lose) way, then nothing has been accomplished as far as improving management practices within an organization. This, unfortunately, is a common outcome but certainly one that can be easily avoided if leaders do their homework to gain a correct understanding of Lean management. If one or more of these are the actual outcome, then we know for certain that managers misunderstood Lean and practiced it incorrectly. This is Fake Lean. It ceases to be Lean the moment it is used for bad. Dumb leaders don’t care about employees’ concerns and will fail to address these six criticisms of Lean management. Yet, these leaders expect employees to support and participate in improvement efforts. That is illogical. In reality, employees will not support Lean and participation is half-hearted, if at all. The result is a pace of change that is much slower than needed, which, in-turn, reinforces the view among employees that Lean management is just another flavor-of-the-month. Smart leaders, knowing that employees have these six concerns, address them from the start and on an ongoing basis. The six criticisms help guide management thinking and decision-making away from outcomes that could harm employees and provide evidence to them that their concerns are valid. By confronting these criticisms, management gains employee buy-in, which results in wider support and more enthusiastic participation. The result is a pace of change that is much greater than expected, which, in-turn, reinforces the view among employees that Lean is both good for them and good for everyone else. What I outlined above is what happens in for-profit businesses. But the situation is no different in not-for-profits, government, or for institutions of higher education. People, no matter what type of organization, have serious concerns when they are asked by their leaders to learn new things and do their job differently. They want to know that their leaders know what they are doing, and that their leaders are asking the same of themselves that they ask of others. Couldn’t agree more, I called it the Lean Paradox (in my book: We are not TOYOTA ). 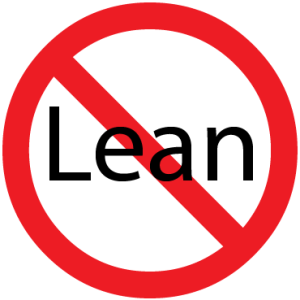 When Lean is a zero-Sum game, Lean is Mean, or not Lean at all!